Mildred Larson passed away June 15, 2011. 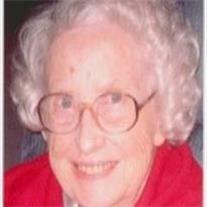 Born January 11, 1919 in Negley, Ohio, Millie was the seventh of eight children born to Ira and Elfie Huston. In 1938, she married Chester Harding who predeceased her in 1959. She is survived by her three children: Larry Harding of Leetonia, Ohio; Janet (Ernie) Keslar of East Palestine, Ohio; Pat (Dan) Toomey of Scottsdale, Arizona; nine grandchildren; and nine great-grandchildren. In Columbiana she worked at Wells’ Drug Store, and served as Eastern Star Worthy Matron of Chapter 428. She was a member of United Methodist churches in New Waterford and Columbiana, OH, and Mesa, AZ. In 1980, Mildred moved to Arizona. She married Barney Larson who passed away in 1991. Visitation will be at 10 am followed by a service at 11 on Thursday June 30, 2011, at Bunker Family Chapel, 3529 E. University Dr. Mesa, Arizona 85213.